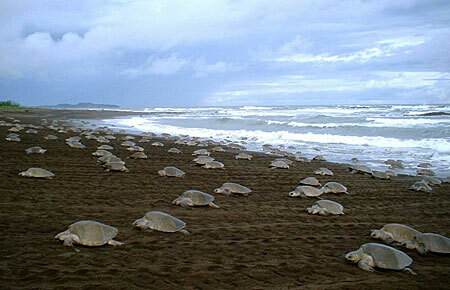 During arribadas, mass nesting events, thousands of Olive Ridley sea turtles come ashore within a few hours or days. Sea turtles are large, aquatic reptiles with forelimbs specially modified for swimming. These front flippers are significantly larger than the back flippers. Their shell is composed of two pieces, the top, or carapace, and the bottom, or plastron. In most sea turtle species, the shell is made up of bony plates covered with horny shields. The Olive Ridley sea turtle is relatively small compared to other sea turtle species, averaging 100 pounds in weight and measuring 2–2.5 feet in length. It has a gray-green heart-shaped shell. This species has a greater and more varied number of plates along the back of its shell compared to other sea turtle species. Each flipper has 1–2 claws. The shell height and coloration varies by region. Olive Ridley sea turtles reach sexual maturity around 15 years of age. Once reaching maturity, females nest once or twice every year. Clutch size averages 100 eggs. In the breeding season, large groups of turtles gather in the waters just offshore of their nesting beaches. Simultaneously, all the turtles come ashore in huge numbers in what is known as an “arribada.” During arribadas, hundreds of thousands of females come ashore to dig their nests and lay their eggs. Not all females nest during the arribada. Some females nest alone or may practice a mixed strategy where they nest once during an arribada and once as a solitary nester in the same season. The eggs incubate for 50–60 days. After incubation, hatchlings emerge from the nest and make their way to the water. These hatchlings are approximately 1.5 inches long and weigh less than an ounce. They are generally black and may have a green hue along their sides. Olive Ridley sea turtles feed on a wide variety of prey including lobster, crab, tunicates, mollusks, shrimp, and fish. They are also known to consume algae. This sea turtle is capable of diving up to 500 feet when foraging for benthic invertebrates. Olive Ridley sea turtles migrate each year between their pelagic foraging areas and coastal breeding and nesting grounds. These migrations can cover thousands of kilometers. They do not follow specific migration paths but disperse to different areas from the breeding grounds. The Olive Ridley sea turtle is distributed throughout tropical and subtropical regions of the Pacific, South Atlantic, and Indian Oceans. In the Eastern Pacific, they are found from Southern California to Northern Chile. In the South Atlantic they occur along the coasts of West Africa and South America. Though solitary nesting occurs on beaches throughout its range, arribadas occur on only a few beaches in the Eastern Pacific and Indian Oceans including beaches of Mexico, Nicaragua, Costa Rica, Panama, and India. Though not common in Alaska, sea turtles do occasionally visit Alaska’s Gulf Coast waters. 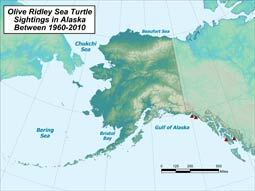 Olive Ridley sea turtles have been reported in Alaska three times between 1960 and 2007. This sea turtle species is predominantly pelagic, inhabiting the waters of the open ocean, but can sometimes be foraging in coastal areas. The species moves to coastal waters during the breeding season, and females come ashore to lay their eggs. The Olive Ridley sea turtle is the most abundant sea turtle in the world but also the most exploited. The current global population is much lower than its historical level. The Olive Ridley Mexico breeding populations are listed as endangered under the Endangered Species Act (ESA). It is listed as threatened throughout the rest of its range. To learn more, visit the ADF&G Special Status page for Olive Ridley sea turtle. There has been a 50% decline in the global population of Olive Ridley sea turtles since the 1960s. Though the overall trend is decline, some populations are stable or increasing. This decline is due to long-term historical harvest, incidental take in fisheries, and degradation or loss of nesting habitat. The biggest threat to the Olive Ridley sea turtle is harvest. Their habit of coming ashore in incredible densities during arribadas makes them very vulnerable to overharvest. In many parts of the world their eggs are collected and the adults are killed for consumption. This practice prevents the recovery of the species and may lead to continued declines. Bycatch in fisheries is another major problem for Olive Ridley sea turtles. These turtles are frequently caught in trawls and longline gear. They may also become entangled in gill nets and purse seines causing them to drown. Loss of nesting habitat is also a threat.